Jim visited Laticrete yesterday .... He visited and checked on Elmo. Then we fed him lunch and "picked his brain ....!" Jim spent some time chatting with several of our Laticrete Product Managers - Jay, Jon & our new guy, "JD"
What comments do YOU have for us ...? Vietnam is a fascinating county. The people are incredibly friendly towards Americans. While Vietnam is a "Developing County" and the population is about 87,375,000 people they consume about the same amount, the square footage of ceramic tile as the USA does ...! They seem to tile just about all floors...! And many walls. They like tile ... they like the durability of tile. I visited a Panera Bread jobsite in Newton, MA yesterday afternoon / evening. A jobsite visit and dinner with the guys. Tile guys are working from 2 in the afternoon until 2 in the morning. 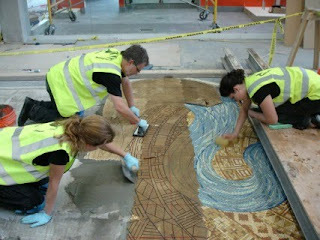 This avoids the carpenters, plumbers etc walking on fresh tilework. Installation was in progress when I arrived. 6 x 6" Metro Quarry Tile. Hanging chairrails on an arch - Laticrete 255 to the rescue! 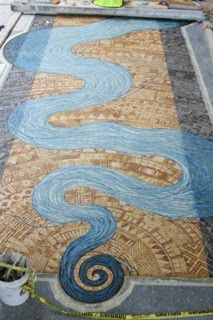 Drostle’s spectacular, 12’ x 47’ intricate porcelain and glass mosaic art mural. 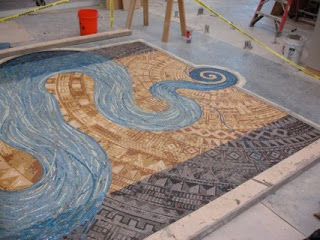 Inspired by the connection Iowa City and the state university both share with the Iowa River as it knifes directly through the center of each on its way to joining the Mississippi, Drostle’s concept for this mosaic mural centered on the river as the vision of well-being or a path through life, rather than just a state of being at a single moment in time. Installed over masonry in the traditional two-step process, the River of Life is manifested with ½” and ¼” unglazed Winkelman French porcelain mosaics interspersed with Bisazza mosaic glass highlights. Various liquids are squirted onto SpectraLOCK samples with water pistols. Effective display of stainless grout characteristics in a tile showroom ...! 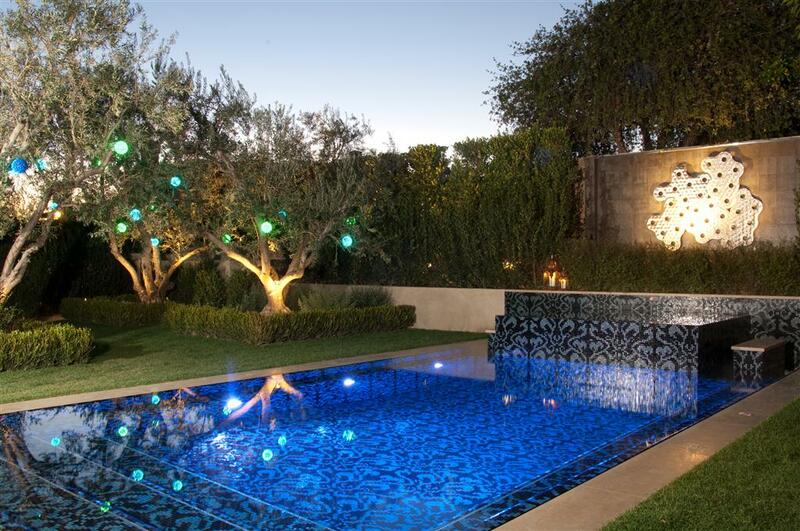 I am of course extremely proud to be associated with Jimmy & his pool projects....! Do you feature us, Laticrete, in your promotional efforts ...? When we install tile or stone on your project with Laticrete premium mortars & grouts your tile & stone work is covered by a lifetime warranty. 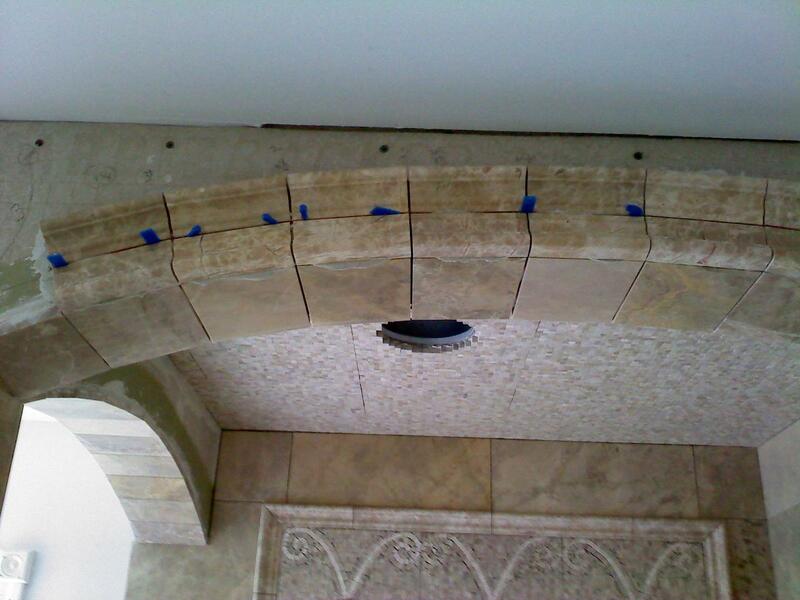 We use the best possible installation techniques and materials available and prefer to use Laticrete tile & stone installation products. Laticrete products are Green and are GREENGUARD certified. Laticrete products include MicroBan to reduce mold & mildew problems. We recommend Laticrete HydroBan waterproof membranes for all tile & stone wet area installations to prevent leaks as well as mold & mildew problems. We recommend & feature SpectraLOCK, the “Stainless Grout” that never needs sealing. In 2008, Laticrete launched the industry’s first thin-set that passed the ANSI specification for crack isolation and reduced sound transmission - and in March 2010 the new and improved Laticrete 125 Sound & Crack Adhesive was released. Laticrete125 Sound & Crack Adhesive is now a single component product that you just add water to and mix, spread and install tile or stone. Very simple – there isn’t a faster easier way to get anti-fracture and sound reduction! You can eliminate the labor cost and time associated with peel & stick mats, rubber sheets or liquid and fabric systems – Laticrete 125 Sound & Crack Adhesive allows you to just mix, spread and begin setting tile! The performance is proven and the product is backed by an available 25 Year System Warranty*. No other company or product offers such innovation & value! 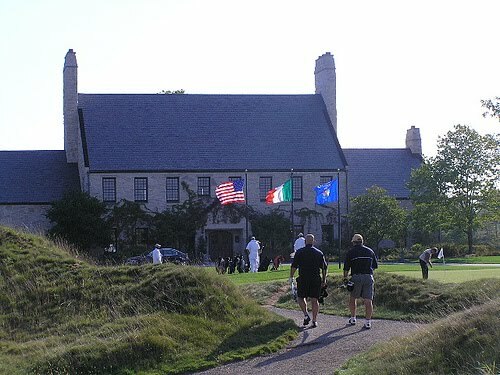 Had a lovely dinner this evening with a group of Ceramic Tile people at the Whistling Straits Barn at a Laticrete event. Tomorrow many of the group will play some golf at the Whistling Straits course. 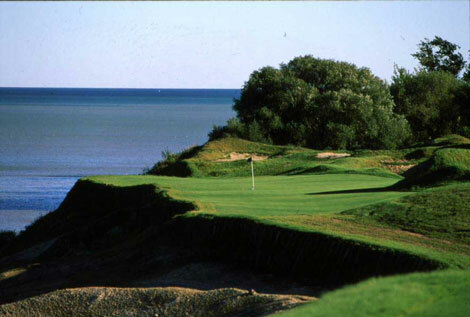 I'm told that in a few weeks the PGA plays here....! "Just finished this little splash, figured I would do a product placement pic." My presentation was in Hanoi so naturally my presentation was in Vietnamese....! I presented to a group of Architects, Consultants, Developers and Contractors. Part of my presentation focuses on changing from the old thick bed, Portland Cement Sand bedding method to the newer, light weight, thinner thin bed adhesive mortar method for installing ceramic tile and stone. 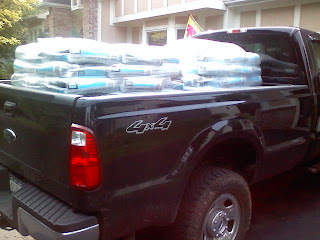 I focused on changing from Jobsite prepared PC / sand bedding mortars to factory manufactured, tightly quality controlled thin adhesive bonding mortars for installing tile and stone. Vật liệu xây dựng và phương pháp đang thay đổi. Sons & con gái của chúng tôi sẽ không sử dụng cùng một phương pháp xây dựng và vật liệu mà ông nội của họ được sử dụng trong quá khứ. Construction materials and methods are changing. 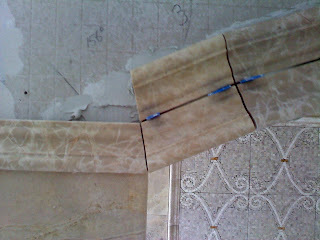 Our Sons & Daughters will not use the same construction methods and materials that their grandfather used in the past. Today building are taller, lighter in weight and are constructed faster than buildings in the past. Today we discuss new construction materials and methods. Today we discuss the thinbed method of installing tile. A method of using 3 to 9mm of adhesive mortar for bonding tile rather than the 25 to 50 mm of Portland Cement / Sand Mortars that our fathers used. Hôm nay xây dựng được cao hơn, nhẹ hơn về trọng lượng và được xây dựng nhanh hơn so với các tòa nhà trong quá khứ. Hôm nay chúng ta thảo luận về vật liệu xây dựng mới và phương pháp. Hôm nay chúng ta thảo luận về phương pháp thinbed cài đặt ngói. Một phương pháp sử dụng 3 đến 9mm của vữa kết dính cho ngói liên kết hơn là 25-50 mm của Xi măng Portland / Sand cối rằng cha của chúng tôi sử dụng. The grand opening ceremony began with speeches and was concluded with a formal ribbon cutting and traditional Chinese fireworks! July trip to Cape York, 2nd from right is Jason Wyllie from Wyllie Tiles in Tasmania one of Laticrete's longest and best clients. Great trip by all, 4 motor bikes and 2 four wheel drives, 14 days of dirt, dust, river crossings and crocodiles. Dinner with the Laticrete Beijing China Sales Team after a day of Sales Meetings & Training. Can you find me in the photo ....? "This just needs to get posted every once in a while..... just because." 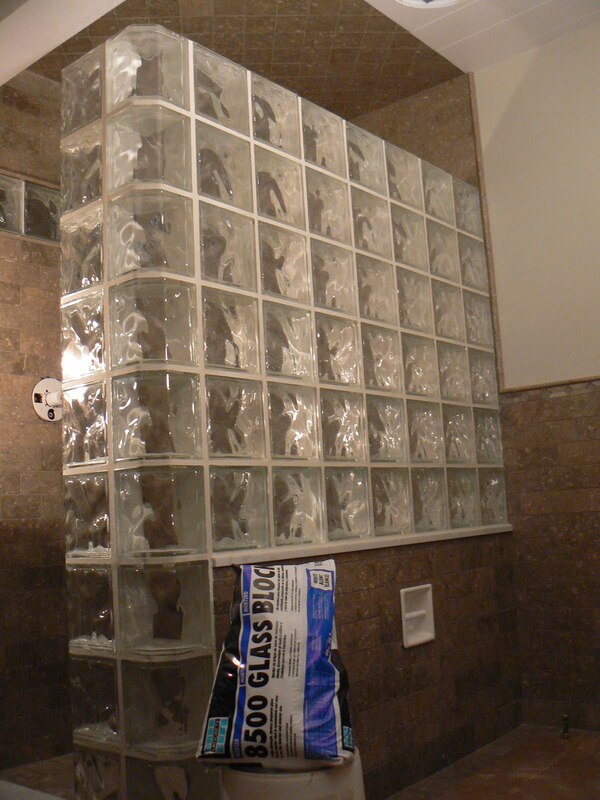 Need tilework done in East Texas ...? Love my Laticrete 252 !!!! 2 pallets of 3! I wanted to number one thank Eric, Todd, and Jeff ( with the rest of the presentation group ), for the outstanding seminars and on hands training we were invited to in Indianapolis May 19 - 21. The time spent was one of the most informative and well organized manufacturer events I have attended. 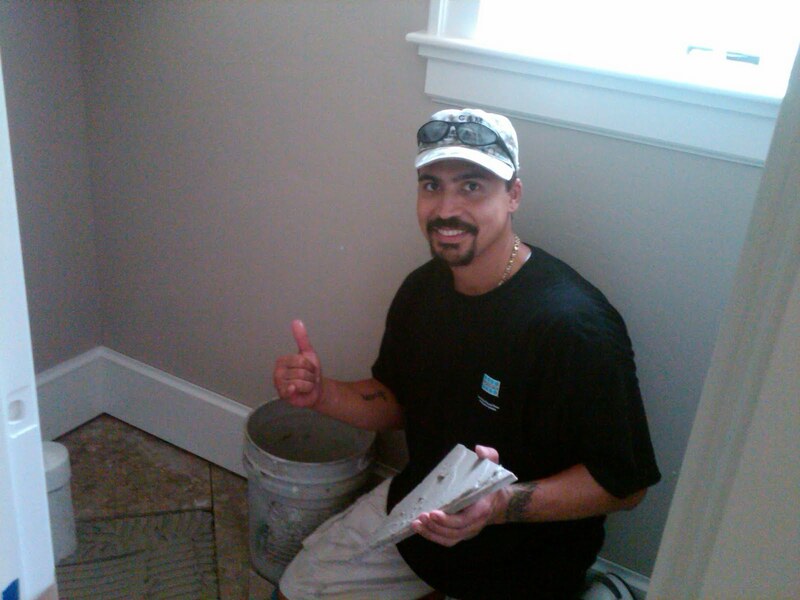 I will certainly not hesitate to send our other sales people or contractors in the future. I have included a few photos of a project we have just completed at the Ho - Chunk Nations Casino just north of Madison, WI. The project is the main entrance / atrium of the hotel and casino, about 22,000 sf. 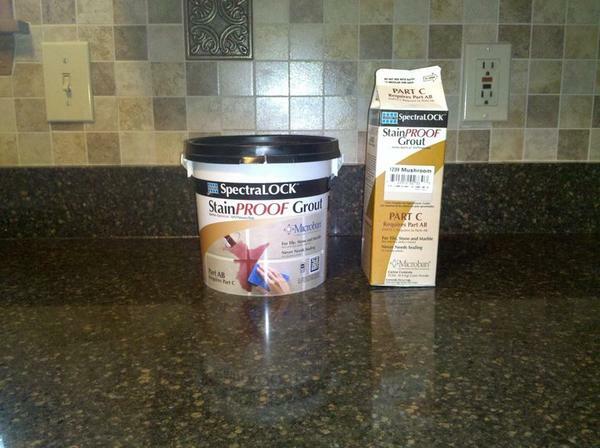 All the setting materials were Laticrete products, including Laticrete #125, SpectraLOCK, and Latisil. The installation was a textbook example of how to make sure the installers were comfortable with several products they may not have been totally use to working with on a day to day basis. Before the project began we hosted a training seminar for approximately 60 installers showcasing the new Laticrete #125, SpectraLOCK IG, and 4-XLT. This event included the crews working at Ho - Chunk. Todd Bartosz and Jeff Kimmerling made a presentation that was factual, concise, and still comfortable and hands on for the installers, ( not an easy task ). The training did not end there. Todd made sure that he attended the phases where the crews at Ho - Chunk began using Laticrete on site, including a trip that required him to be on site at 4:00 am on a Sunday. We as a company , and especially me as an Outside Sales Manager, appreciate the quality of the Laticrete products and regional representation. These examples make it a pleasure to be partners with Laticrete on a daily basis. Again, thank you for your efforts. Have a great weekend." A Laticrete Guy & His Commitment To "Doing Good"
I am .... asking for your help! I am looking to "raise the bar" on fund raising and would love to have you ...... support my cause. In approximately four weeks I will be riding across the state of Massachusetts in the 2010 Pan Massachusetts Challenge (PMC). This 190 mile bike ride, over 2 days, is a fundraising effort to support cancer research on behalf of the Dana Farber Cancer Institute in Boston, MA. This will be the longest journey on a bike I have taken, yet will not compare to the challenge many of our friends and families face fighting cancer. currently being treated at the Dana Farber and is awaiting a bone marrow and/or stem cell transplant. I am sure we each have our own stories to tell of friends suffering from this disease. Please let me know and I will attach their names to my jersey during the ride. I am writing today in hopes that you will join me in this fight. The PMC gives 100% of the funds raised directly to cancer research and treatment. My goal is to raise $15,000 and I am asking for your help. Our efforts and your support will help ease the burden of families that have to endure this hardship and will get us closer to reaching our goal. We train and ride with thousands of special people in mind and hope in our hearts. I will ride, but I do need your help to reach the ultimate goal - a world without cancer! Thank you in advance for your support! The Home page of the Laticrete Norway website - http://www.laticrete.no – features the new Laticrete iPhone App …! "I had heard a lot about Spectralock, but had forgotten the name. I'm gonna guess you know about the grout and we can switch to it for this job"
200 more sf / 3 full units and a happier customer just for wearing the right tee shirt to work today. 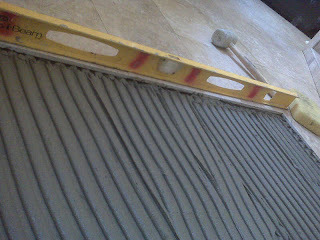 12" x 12" Travertine being installed with Laticrete 4-XLT. Laticrete 4-XLT is a multi-use, polymer fortified adhesive mortar offering tremendous utility including non-sag wall installations, medium bed build up of up to 3/4" (19 mm) and thin-set applications on floors. Read more regarding Laticrete 4-XLT here and here. In many parts of North America hot weather is upon us! This can create a range of tile & stone installation issues, problems & challenges. Click here to access a library of Laticrete Technical Data Sheets. What Do Laticrete Reps Do When On Vacation ? 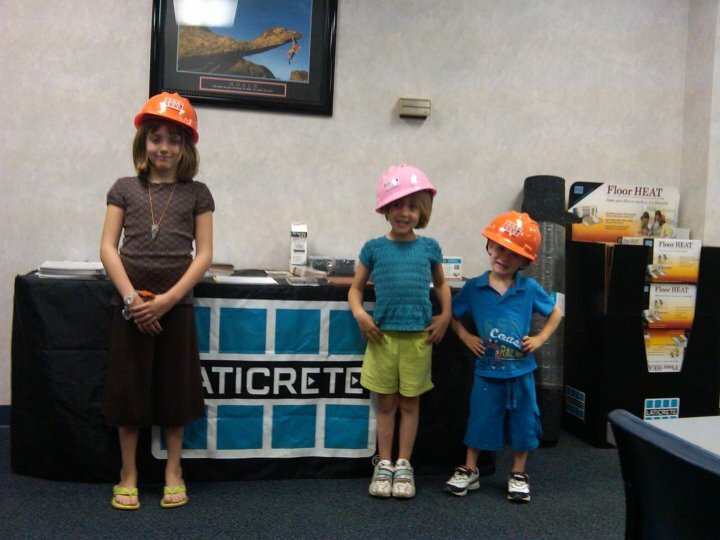 "While we were on vacation my family asked if we could stop by the plant and see “Laticrete, where daddy works.” They got to meet everyone there and see the plant, training room, offices and docks. The Laticrete sign on the tower was a big hit but I think the helmets were the highlight. Kylee (9), Hailey (5) and Cody (3) at Laticrete Indianapolis in the attached photos. Just thought I’d share." What do Laticrete people do in their free time….? It is kind of cool. It doesn’t really tell all the results, but I took second in all 3 events that I played in. Losing to one or two of the top 5 ranked players in the world.